The Libertarian Christian Institute is an ecumenical Christian organization which brings together Christians from a variety of theological backgrounds. Though our theological differences don’t affect libertarianism, sometimes they intersect it. And when this happens, it’s prudent to share and grapple with our differing perspectives. Peter Enns is a Westminster trained Biblical scholar, holds a Ph.D from Harvard, and he objects to the inerrancy of scripture.1 He objects because Christians can’t agree on everything the bible affirms and teaches. While Enns questions the historicity of much of Scripture, he says, “portions of Scripture that do rightly affirm/teach include the 10 Commandments, Jesus’s teachings on forgiveness, the Beatitudes, and many other things.” These things are true, Enns argues, because they’re related to faith and salvation. Enns illustrates his point using Romans 13; the thorn in the flesh of Christian libertarians. Enns agrees that Paul is teaching/affirming something, but whatever it is, the standard interpretation of Romans 13 runs counter to the founding of America, which is born from an act of violence and treason.2 So what gives? Enns has a valid complaint here. How do we interpret Romans 13? Enns points out common concerns with the text given we believe it doesn’t apply to certain situations.3 Of course, this nuance isn’t explicit either; we must infer it by considering other passages like Acts 5:29, which incidentally, and perhaps ironically, is in the context of disobeying religious authorities. So what exactly is Enns’ problem with inerrancy? To answer that, I need to unravel it from Biblicism. Why is this a confusion? 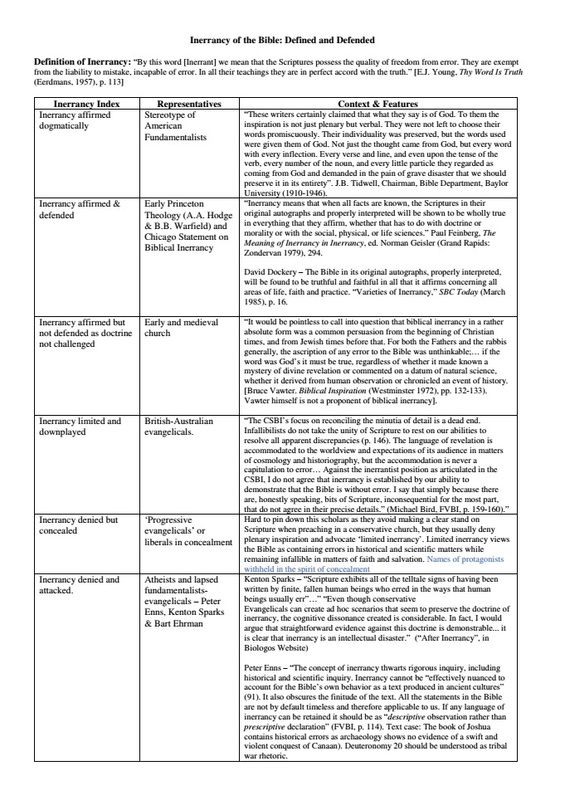 Krisis and Praxis gives an excellent overview of the varying degrees of inerrancy. At the top, is Biblicism. But Biblicism doesn’t appear to be the position of A.A. Hodge and B.B. Warfield, the writers from Old Princeton who drafted the doctrine of inspiration.